From Zion National Park, we have been enjoying the drive through canyon country. Last night we arrived at Bull Frog Marina campground. Today we are waiting for Cady and Art to arrive, friends from Wyoming. We spend the morning exploring the area, taking a run and are amazed at the water level of the lake. Several of the marinas are closed due to low water. It is down over 20 feet from its high over 10 years ago. Should not be a problem for kayaking. The Glenn Dam is what creates Lake Powell by damming up the Colorado River. The Glenn Dam is located in Paige, Arizona. Next week we will be be below the dam rafting the Colorado River. Cady and Art arrive mid day and the rest of the day is spent organizing. 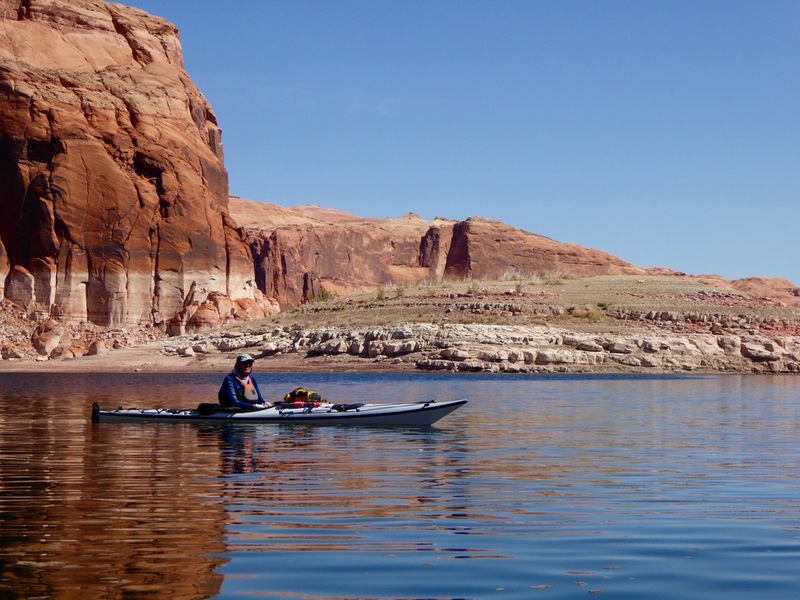 In the morning we head down to the lake, load our kayaks and take off surrounded by steep canyon walls. One finds it hard not to imagine what the walls looked like before the dam was built. Pull outs and camping spots are limited. Some of this is due to the water level. The sun is out in full force and Don takes full advantage of his sun blocking buff.